This book is written in 2009. Based on the planet positions that can be calculated in advance, we believe that if the birth time is correct he will marry in 2019. The most likely period for his marriage is between the ages of 37 to 39, when his 1st (Self) House in transit, @, is in Aquarius. The first indication is shown in the birth chart. In relation to @ in Aquarius, the 7th (Spouse) House is Leo. The Ruler of Leo is the Sun (1). Therefore while @ is in Aquarius, the Sun (1) represents spouse. In the birth chart, the Sun (1) is in Gemini. In relation to @ in Aquarius, Gemini is the fifth House of youth, sudden luck. Therefore while @ is in Aquarius, Gemini represents sudden luck. The planet that now represents spouse is in the House that now represents sudden luck is the first indication. In the birth chart, Leo, now the House that represents spouse is in sextile with Jupiter (5). Jupiter (5) is the Ruler of Sagittarius. In relation to @ in Aquarius, Sagittarius is the 11th (Luck) House. Therefore, while @ is in Aquarius, Jupiter (5) also represents luck. The planet that now represents luck in the position to reach the House that now represents spouse is the second indication. In the birth chart, Jupiter (5) is also in trine with the Sun (1) and can influence each other. While @ is in Aquarius, the Sun (1) represents spouse, and Jupiter (5) represents luck. Luck is able to reach spouse while @ is in Aquarius. In the transit chart, the Sun (1) which represents spouse is in Aires, in conjunction with Lagna. The Sun (1) is in Exalted position, especially strong. The planet that now represents spouse reaches self, Lagna in the birth chart. In the transit chart, Jupiter (5) which represents luck is in Sagittarius. It is strong in Ruler position. 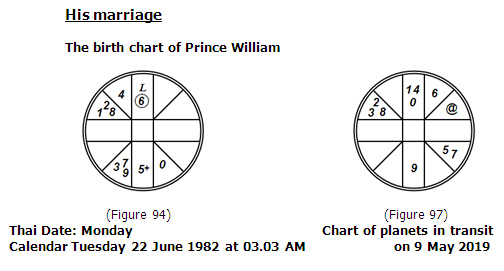 Jupiter (5) that now represents luck is in trine with the Sun (1) that now represents spouse is another indication. Jupiter (5) in transit is also in trine with Lagna in Aires. This is the third indication in the transit chart. We therefore see his marriage occurring between the 14 April and 15 May 2019.